Portsmouth potter Samuel Laxton has booked a place in the last-16 of the English Under-14 Championship. The 13-year-old topped his round-robin group without dropping a frame in the southern qualifier at Frames Sports Bar, Coulsdon, south London. Laxton kicked off a triumphant day by beating Chandler’s Ford’s Riccardo Drayton, who competes on a higher tier of the Cuestars under-21 circuit. Silver tour player Laxton overcame his gold tour opponent 2-0 and then repeated the scorelines in his matches against Finley Brown, from Great Yarmouth, and Gabriel Fox, who hails from Brackley. World Snooker coach Tim Dunkley, who runs the twice weekly junior snooker leagues at Waterlooville Sports Bar, praised the young potter. He said: ‘It was a magnificent effort by Samuel. Laxton felt getting the first win was key to him making progress. However, there was no 15th birthday joy for Laxton’s club-mate Jamie Wilson. The teenage talent from Havant won three of his five matches in the next day’s under-16 qualifier but failed to secure one of the top two spots in his round-robin group. The knockout stage is at the Northern Snooker Centre, Leeds, next May. 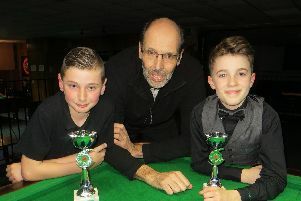 Three days later, Laxton all but secured his third Wednesday Junior Snooker League title. He takes a seven-point lead over Wilson and Zak Truscott into next week’s final round of matches after chalking up breaks of 39, 29, 28, 27 and 23 in his four games. Billy Reid leads division two by two points from Tyler Mack. Ryan Kneller won a tense black-ball game against Jayden Brookes to open up a three-point gap over Aaron Wilson at the top of division three. Meanwhile, Jamie Wilson was undefeated in the top group of the Monday Junior Snooker League and closed the gap to division one leader Truscott to eight points with five weeks remaining. Kneller is now joint top of division two with Tom Shuttle. And defending Junior Pool League champion Brookes won five of his six matches to close the gap to Keira Hiscock to one point going into the second half of the 20-week season. World Snooker coach Tim Dunkley runs snooker sessions for under-19s from 4.30pm to 6.30pm every Monday and Wednesday and junior pool sessions from 4.30pm to 6.30pm every Thursday.